This coming Thursday, December 3 at 7PM, immediately following our Board of Directors meeting, we shall host our Annual Thank You Get Together for all our clients and key partners at the Nairobi Kempinsky. It is the strong support of our partners that has led to a very successful 2015 for the firm with very strong growth across all key business metrics. Treasury bill auctions were undersubscribed during the week, with overall subscription at 38.2%, compared to 103.5% the previous week despite relatively high liquidity in the money market. Investors preferred short-term investments with the 91-day Treasury bill being marginally subscribed while the 182 and the 364-day registering significant under subscription. Yields on treasury bills continued to decline settling at 9.2%, 10.1% and 11.9%, from 9.6%, 10.6% and 12.1% for the 91-day, 182-day and 364-day papers, respectively. The 5-year bond results were released and the subscription was at 165% as the government got Kshs 33.00 bn compared to Kshs. 20 bn that they were looking for. Of note is that the CBK accepted Kshs. 30.7 well above what they had offered to the market. In line with our prediction in the Cytonn Weekly Report #46, the market average of the 5- year bond was at 14.0% and the average of the accepted bids at 13.9%. We had predicted a range of 13.5% to 14.5%. The high subscription on the bond is an indication that investors are seeking for high risk adjusted returns and the high acceptance rate shows that the government remains keen to raise money in the domestic market. The money market was relatively liquid, however skewed to a few banks, which saw the interbank rate decline to 6.0%, from 6.4% the previous week. The Central Bank Liquidity Management continued to boost liquidity distribution in the interbank money market through reverse repos and so far in the month of November, the CBK has injected Kshs. 81.0 bn mainly to support the small banks that cannot access liquidity through interbank. Despite expected cyclical end month demand, the shilling remained stable during the week against the dollar closing at Kshs. 102.1 as the forex reserves remained unchanged at 4.3 months of import cover. The government, in an effort to increase the tax net, signed into law the Excise Duty Bill 2015. However, Parliament is yet to consider the Tax Procedure Bill, which is aimed at the consolidation of the laws that guide the administration of tax laws in Kenya. The Excise Duty Bill, which will be levied on imported motor vehicles, juices, and the traditional sin items like cigarettes and alcohol, is aimed at raising an additional Kshs. 25.0 bn in tax revenue. The Tax Procedure Bill will ease tax compliance procedures and in the long run improve tax collection. With The Kenya Revenue Authority consistently missing their revenue collection target, the harmonization of the 2 Bills will allow KRA to collect the much needed revenue and ease borrowing pressure from the Government. For the month of December Central Bank is issuing a Kshs. 30 bn 9-year Amortised Infrastructure Bond to finance projects in the energy, water and transport sector. The bond has a weighted tenor of 7 years, with a coupon of 11.0% and the allocation of the proceeds will be Kshs. 9.65 bn for Energy, Kshs. 10.00 bn for Water and Kshs. 10.35 bn for Transport. This issuing of the long tenured bond is an indicator that the government views that the interest rate environment has stabilized and is now ready to issue long tenor bonds. Given that infrastructure bonds are tax exempt, they tend to be very attractive to both local and foreign investors. Infrastructure Bonds with a similar tenor are currently trading at 13.0% and given the volatility in interest rates witnessed over the last two months we expect investors to seek a premium while investing in this bond and we shall be giving the expected bidding rate of the bond in the next Cytonn weekly. Note that Infrastructure bonds are tax-exempt, consequently, the 13% yield offer is comparable to 15.3%. The Government is on track with its borrowing programme having borrowed Kshs 135.5 bn for the current fiscal year compared to a target of about Kshs 91.3 bn assuming a pro-rated borrowing throughout the financial year. Having issued a 5 Year Bond and planning to issue a 9 Year Infrastructure Bond in December, the Treasury views that the interest rate environment has stabilized and want to lock in funds for the long term. We maintain our view that investors should be biased towards short-term fixed income instruments given the uncertainty in the interest rate environment. During the week the market took a pause from its recent gains with NASI and NSE 25 declining 2.8% and 1.0%, respectively, while NSE 20 remained flat, on the back of losses in Standard Chartered and Safaricom that declined 8.1% and 7.8%, respectively. Equities turnover fell by 43.2% to Kshs 2.0 bn from Kshs 3.6 bn the previous week. Foreign investor?s participation declined during the week to 63.3%, from 68.5% the previous week with foreign investors being net sellers for the fifth straight week with net outflows increasing 125.5% w/w to Kshs 622.2 mn from Kshs 275.9 mn. The sustained foreign investors net outflow can be linked to a shift in global investor portfolio flows based on the impeding rate increase in the US that has reduced their risk appetite for securities in emerging and frontier markets. 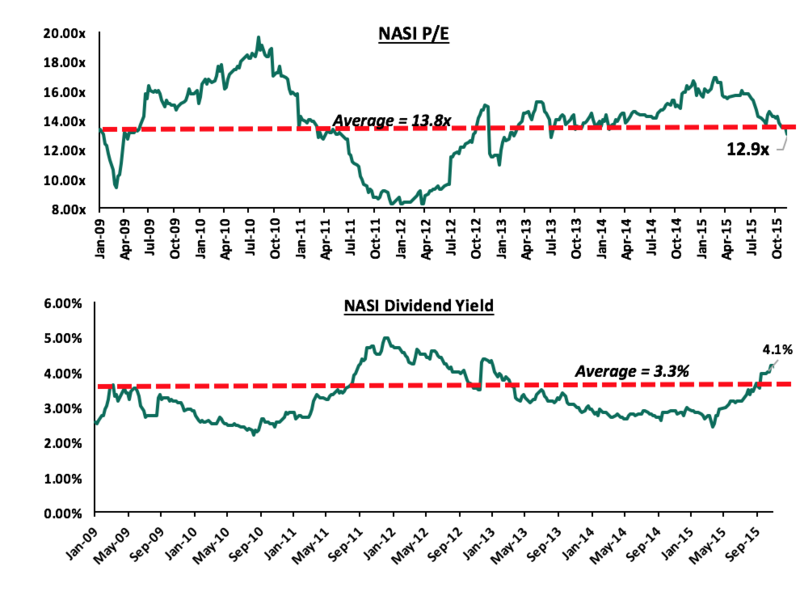 Since the February peak, NASI and NSE 20 are down 19.5% and 27.4%, respectively, and down 12.3% and 21.9% on an YTD basis, respectively, while NSE 25 is down by 0.1% inception on 2nd October 2015 to date. The market is currently trading at a price to earnings ratio of 12.9x, versus a historical average of 13.8x, with a dividend yield of 4.1% versus a historical average of 3.3%. The 20% to 27% stock indices decline from the February peaks, coupled by market PE valuation below historical average and dividend yield above historical average could be a signal that the market is generally oversold. However, we do not see that to be case because earnings growth for listed companies have also been below historical average in the past one year. The charts below indicate the historical PE and dividend yields of the market. PAT grew by 120.8% y/y to Kshs 2.3 bn from Kshs 1.0 bn in Q3?2014. This was mainly driven by operating revenue growth of 20.6% far outpacing operating expense growth of 1.5%. The contained expense growth led to a decline in cost to income ratio to 63.5% from 75.5%. For National Bank, the growth in PAT is largely attributable to cost containment and one off gains from the sale of some real estate assets. PAT declined by 33.6% y/y to Kshs 2.8 bn from Kshs 4.1 bn in Q3?2014. Operating revenue declined by 7.9% driven by a decline in non-interest income which fell 22.5% y/y to Kshs 4.9 bn from Kshs 6.3 bn last year, on account of a drop in forex trading income. Operating expenses were up 3.9% y/y to Kshs 7.4 bn from Kshs 7.2 bn owing to a 7.8% y/y increase in staff costs to Kshs 3.5 bn from Kshs 3.2 bn in Q3?2014, raising the Cost to Income ratio to 63.9% from 56.7% in the same period last year. Notably deferred tax charge of Kshs 1.1 billion suppressed the earnings. The significant exposure to fee income is hurting CFC at a time when economic activity is subdued. The significant exposure to non-funded income (at 42% of revenue relative to industry average of about 20% of revenue) significantly hurt CFC?s performance. To manage volatility, CFC has to either reduce its exposure to non-funded income or increase exposure to less volatile non funded income. Standard Chartered has issued a profit warning, indicating that they expect their 2015 full year earnings will fall by more than 25.0%, citing (i) expected high NPL's, which is associated with the bank venturing into offering loans to SME's which has not been their niche and has really affected the quality of their loan book, and (ii) that in 2014, the bank reported a one-off net capital gain of Kshs 1.4 bn relating the disposal of a property, which will not be replicated in 2015. In our view, Standard Chartered is best at being a banker for corporate clients and should stick to their niche and improve on their strengths; they should leave SME and mass banking to KCB, Equity and Cooperative, who are good in that space. Following the release of all third quarter results amongst the listed banks, we will finalize on the Q3?2015 banking sector report and release it on December 14th. A brief overview of the listed banks indicates that the average growth in earnings per share was 9.3%. The stable growth banks with 10% and above growth: Equity, KCB, I&M, and DTB. The strong growth, with above 20% growth: NBK and Coop. It is notable that all strong growth banks were mainly driven by expense containment, whereby revenue growth far outpaced expense growth, leading to strong PAT growth. Uchumi Supermarkets reported Full Year 2015 results, posting Kshs 3.4 bn loss after tax, driven by a 10.4% decline in revenue and a one-off Kshs 1.6 bn impairment provision for the closed branches in Uganda and Tanzania. We will be sending a detailed earnings note early in the coming week. We remain neutral with a bias to negative on equities given the lower earnings growth prospects for this year. The market is now purely a stock pickers? market, with few pockets of value. We continue to be avid buyers of KCB, Equity and Standard Chartered on any price dips. This week, a number of private equity exits were reported across Sub-Saharan Africa region. Actis, RMB Westport and Paragon Holdings have sold their combined stakes, 60%, 20% and 20%, respectively, in Ikeja City Mall to a South African Real Estate Investment Trust (REIT) called Hyprop Investments Limited (Hyprop) and Attacq Limited (Attacq), a JSE-listed real estate capital growth fund. Hyprop acquired a 75% interest in Ikeja City Mall and Attacq has acquired the remaining 25%. Ikeja City Mall is Lagos? largest mall comprising of over 22,000m² and has a tenant mix anchored by Shoprite and several other global luxury stores. Actis and the local partner Nigerian partner, Paragon Holdings, sourced the site in 2008 and then brought in RMB Westport as the development manager. The mall opened its door in 2011. There is an increasing demand for retail spaces within the African market driven by the diverse middle income and youthful population demanding good quality life. This deal indicates strong appetite for yield earning real estate across Africa by South African real estate firms and is very positive for developers who can develop investment grade real estate, stabilize the rent and seek exits. The sight acquisition to opening doors took 3 years, opening doors to rent stabilized exit took 4 years, and hence the entire investment to exit took 7 years. The Abraaj Group, IFC and IFC ALAC Fund announced their successful exit from their investment in Saham Finances (Saham), a subsidiary of the Saham Group. Having bought the stakes in 2012, the three funds have supported the company?s growth strategy by facilitating strategic acquisitions in high growth markets such as Angola, Kenya and Nigeria. Saham has added 11 new subsidiaries to its profile and currently operates 31 insurance and reinsurance subsidiaries in 26 countries in Africa and the Middle East. Earlier in September 2015, Saham Finances bought a 53.6% in Continental Reinsurance PLC, a transaction that saw Emerging Capital Partners exit from the reinsurer. The ease of exit ripens the African private equity attractiveness. Actis has completed an investment of $62 million for a majority stake in Sigma Pensions (?Sigma? ), a leading Pension Fund Administrator (?PFA?) in Nigeria. Sigma was one of Nigeria?s first PFAs and now has over 650,000 registered customers. The pensions industry in Nigeria remains significantly underpenetrated, with pension assets constituting only c.5% of GDP. According to Actis, the PFA industry has demonstrated strong growth and is poised for further expansion. There are currently only c. six million pension-holders in a population of c.170 million, with a median-age of only 19, which supports the growth outlook for the industry. The continued investment in Africa is underpinned by the need and demand for good services among the population. For example, the interest in the overall financial services sector by private equity players is hinged on (i) a rapidly growing and entrepreneurial population and demand for credit, (ii) low financial services inclusion in the region, and (iii) increasing ease of exit in the financial services sector. The REIT Manager will spend the funds raised from the IPO to buy Greenspan Mall. The mall has been valued at Kshs 2 bn and will consume 55.6% of the funds raised. In our view these will be a very high concentration but if allowed Stanlib can reopen the REIT and raise more money in the future to assist with the portfolio diversification. Though the REIT market in Africa is not well developed, there are valuable lessons to be learnt from South Africa, Ghana and Nigeria, the only countries in Africa other than Kenya with listed REITS. South Africa in particular has a very successful and well established REIT market and is the 8th largest REIT market in the world with a market capitalization of approximately R350 bn (Equivalent to Kshs 2.5 tn / USD 25 bn). For the other licensed REIT managers looking to list their REITs in the stock exchange, studying Stanlib and other REIT markets in Africa will provide an added advantage to ensure higher levels of success. The President, his November 23rd speech entitled, "We have opened a new chapter in the war against corruption declared corruption" a standing threat to our national security? The Pope, during his visit to Kenya noted concerns about corruption. Having encountered corrupt practices, this is a topic that Cytonn is very passionate about. The United Nations Development Programme (UNDP) defines corruption as ?the misuse of public power, office or authority for private benefit through bribery, extortion, influence peddling, nepotism, fraud, speed money or embezzlement?. Corruption in Kenya has been prevalent since Independence and major graft scandals have gone unsolved since then. According to Transparency International?s Corruption Perception Index, an annual index depicting public administrative corruption levels within a country, Kenya ranks 145th out of 174 countries, a clear indication of the extent to which corruption runs deep. Corruption exists in various forms, including petty and grand corruption and according to Transparency International?s report on Corruption in Kenya it is estimated that the average urban Kenyan pays 16 bribes per month. The past 2 regimes have been plagued by major graft scandals namely (i) the Goldenberg Scandal during Moi?s regime which is estimated to have cost Kenya 10% of its GDP and (ii) The Anglo ? leasing procurement scandal during Kibaki?s regime. Embezzlement of public funds, and a system promoting political patronage has also been rampant in the country as evidenced by the recent Devolution Ministry Procurement Scandal. The most affected sectors in Kenya are (i) The Police, (ii) Land services, (iii) Public Administration, (iv) Public Financial Management in budget processes, Public Procurement and Revenue Administration, (v) Judiciary and, (vi) the Private Sector. Recently, President Uhuru has also mentioned that 70% of corruption originates or is instigated by the private sector. Corruption is an extremely debilitating plague on two fronts. First, it diverts scarce national resources from productive deployment to the benefit of a few. Secondly, it limits economic growth and development by denying opportunities to genuine entrepreneurs while at the same time rewarding tenderprenuers. Low risk of detection and punishment ? Despite corruption being illegal, individuals found guilty of corrupt offences most of the time go unpunished. Corruption thrived in Singapore as it was perceived by the public to be a low risk, high reward activity as corrupt offenders were unlikely to be detected and punished. Interestingly, these three main causes of corruption in Singapore then are very much present in today?s Kenya. Kenyan civil service salaries are low, the myriad regulations provide ample opportunities for corruption and the cost of corruption is very low since there are rarely any convictions, especially with mega corruption cases. The only new dynamic that we can add is that ethnicity is also a cause for corruption in Kenya because the corrupt have successfully managed to shield corrupt practices as beneficial to their ethnic groups and have rallied their ethnic groups to protect them. Political Will ? Political will serves as the main pillar for any reform. Having genuine motives is the key of turning any initiative and reform into a success. For Singapore, the government has matched its words with deeds by mobilizing the public, and the entire civil service to fight corruption. The first order of political will was put in place by the late Lee Kuan Yew when he made it clear that he did not tolerate corruption. In his book, From Third World to First World, Lee says ?We had a deep sense of mission to establish a clean and effective government. When we oath of office at the ceremony in the city council chamber in 1959, we all wore white shirts and white slacks to symbolize purity and honesty in our personal behaviors and public life? Clear Frameworks on Corruption ? Singapore?s war on corruption revolves around the following four pillars of (i) Effective Anti-Corruption Acts (or laws), (ii) Effective Anti-Corruption Agency, (iii) Effective Adjudication (or punishment) and (iv) Efficient Government Administration. Singapore?s war on corruption has proved to be a success story owing to the Government?s sincere and utter commitment to root out graft as it was consuming the country from within. Its effects is evident as according to the Ease of Doing Business Report 2016, Singapore ranks 1st and in terms of clean government without corruption, Singapore ranks number 7. This is as a result of effective laws and enforcement that keeps corruption at bay. Institutional frameworks ? The government has commissioned various institutions to handle oversight of Government operations such as (i) The Ethics and Anti ? Corruption Commission (EACC) which was created in 2011 to investigate corruption and economic crimes, (ii) The Kenya National Audit Office (KENAO), whose mandate is to publish audited government reports after they have been presented to parliament, (iii) The Public Complaints Standing Committee which was set up in 2007 to receive all complaints relating to public officials and whose mandate also extends to look into allegations of abuse of office, corruption, breach of integrity and unethical conduct and (iv) The Public Procurement Oversight Authority (PPOA) which is in charge of policy formulation and implementation as well as monitoring and oversight of public procurement to ensure the procurement processes comply with the requirements of the act. Have a dedicated high profile office in the presidency focused solely on anti-corruption initiative. Just like he had most the Budget office from treasury to the presidency and just as Lee Kwan Yew moved the lead agency on anti-corruption, Corrupt Practices Investigation Bureau to the office of Prime Minister, President Uhuru needs a high profile Anti-Corruption Czar working from the office of the president. Without giving it much thought, we can?t think of a better person than John Githongo. The person cannot be from the system, they have to be from outside the system and with a track record of confronting corruption. In addition to an Anti-Corruption Czar, the president needs to have a public reporting mechanism for corrupt practices and have independent sniffing mechanism to identify officials betraying public trust and send names to investigating agencies. Effective Anti?Corruption Acts ? The Government on its part has tried to come up with laws governing corruption but it needs to cut across all sectors, public and private. The Anti ? Corruption and Economic Act 2003, as an example, which criminalizes active, passive and attempted corruption only covers the public sector but not the private sector. Effective Anti-Corruption Agency - The Ethics and Anti ? Corruption Commission (EACC), which was created in 2011 to investigate corruption and economic crimes, has been inefficient as it has failed to effectively lead to the prosecution of even one person since its inception. Fully noting that EACC is a constitutional body, a fresh start with a completely new agency is one alternative or a reinvention of EACC is another alternative. But the public has lost confidence in EACC and it is important that the anti-corruption agency enjoys public confidence. It would also be helpful give EACC prosecutorial powers. In addition to EACC, we also have the investigative functions under the Director of Criminal Investigation and prosecutions under the Director of Public Prosecution. The President has to take a direct and objective interest and evaluate into the probity and effectiveness of these agencies. Effective Adjudication (or punishment) ? The Judiciary in Kenya, as highlighted before is one of the Government arms that is affected by corruption. According to Freedom House (2012), since 2003, only 51 government officials have been convicted on corruption charges. The judiciary has so far seemed credible and enjoys a higher level of public confidence. The key challenge here remains the amount of time it takes to hear cases. Efficient Government Administration - An efficient administration is one which values integrity and incorruptibility. The Kenyan administration needs to embrace values of integrity and service. This serves as the final pillar of an effective campaign against corruption. Even if we have tough laws and strong enforcement, but the government is inefficient in addressing public needs, then opportunities will present themselves for corruption to thrive. For example, it is now a commonly known fact that if you need a Kenyan passport and you are willing to wait for the stipulated processing period, you can just apply and wait and your passport comes out. This is a big improvement from a time when passport processing was highly inefficient and unpredictable. Implementing the above strategy will be a great step but following Singapore?s example, systems, structures and processes do not necessarily provide the path for success. The issue lies with sincerity of purpose, genuine efforts and the overall operating climate. Kenya has the structures, systems and processes in place but unless there exists a genuine will on the leadership?s part to succeed, any anti-corruption programme will remain a passive declaration. It is much more a mindset challenge rather than a question of fixing the system. As Lee Kuan Yew said, ?It is easy to start off with high moral standards, strong convictions, and determination to beat down corruption. But it is difficult to live up to these good intentions unless the leaders are strong and determined enough to deal with all transgressors, and without exceptions.? Singapore?s GDP per capita in 1960 when Lee Kuan Yew launched the war on corruption was USD 427.9, today it is USD 56,286.8, a 132 times increase. This illustrates the very real benefits of winning the war on corruption.